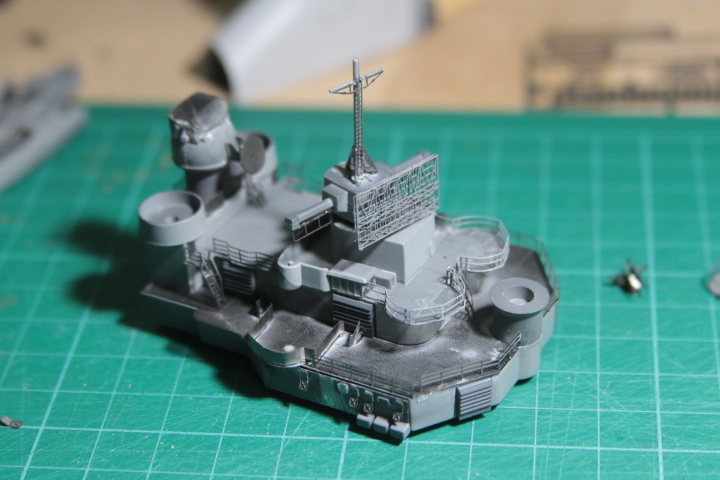 The Ship Model Forum • View topic - 1/350 Tamiya DKM Tirpitz Build. 1/350 Tamiya DKM Tirpitz Build. 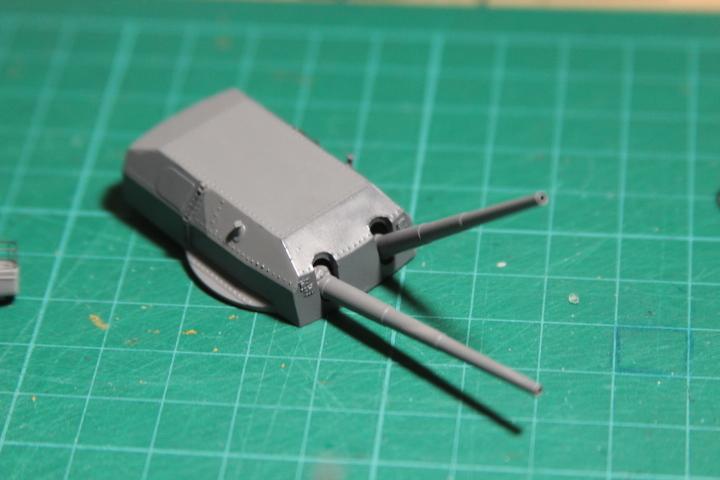 Post subject: 1/350 Tamiya DKM Tirpitz Build. This is my current project with my twin brother. 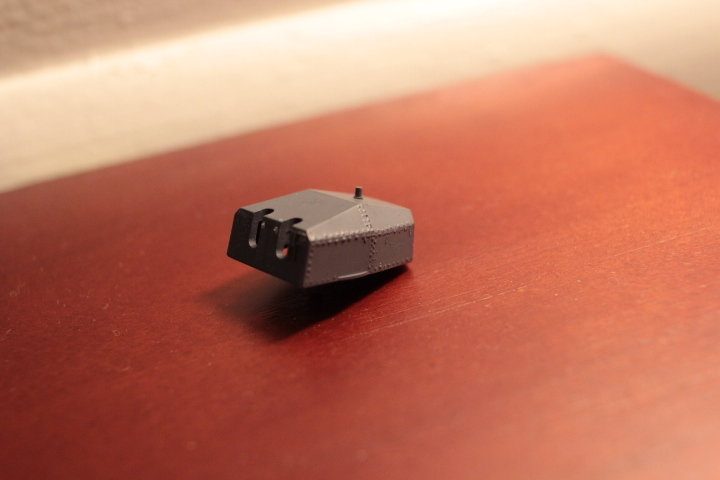 This is going to be one of our first completed models, maybe after the AFV I-58 submarine that should be completed first. - Aber 38 cm, 15 cm and 10.5 cm metal barrels. The camo is not yet painted. Here are some pictures of the progress. Note: this is one of our first formal models with PE, so there are some errors to be fixed by some more experiences. Plus we have not much knowledge of tools that would ease up the build. Last edited by Aop Aur on Tue Dec 22, 2015 4:45 am, edited 2 times in total. 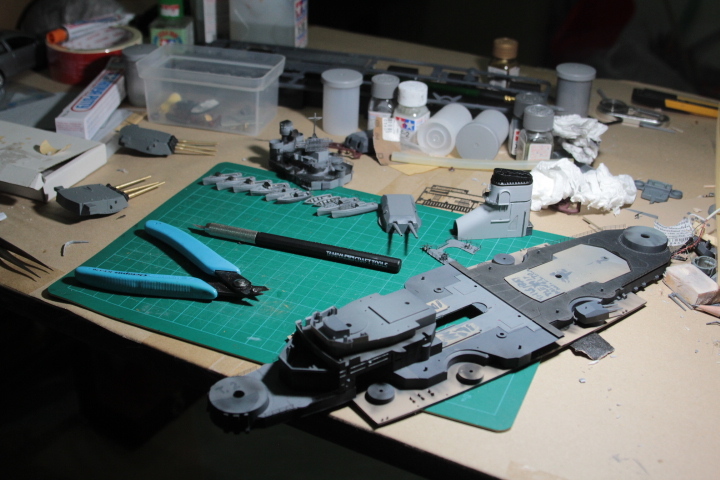 Post subject: Re: 1/350 Tamiya DKM Tirpitz Build. Last edited by Aop Aur on Mon Dec 28, 2015 11:11 am, edited 1 time in total. I am going to need some good, detailed photos of her including some of the surroundings, such as the mountains and torpedo nets, etc. So if any of you have some references for this, please post it here. BTW, can anyone identify me which colours were used in the camouflage. And also which Tamiya colours I should be using. The colours of the camouflage spots on the deck are unknown to me, so please help! I deleted my post, that already had the link above, John Asmussen(sp?) drawing. Hi to all and merry christmas!! Thank you for the web Steve & MarOnca. Here are some more progress! 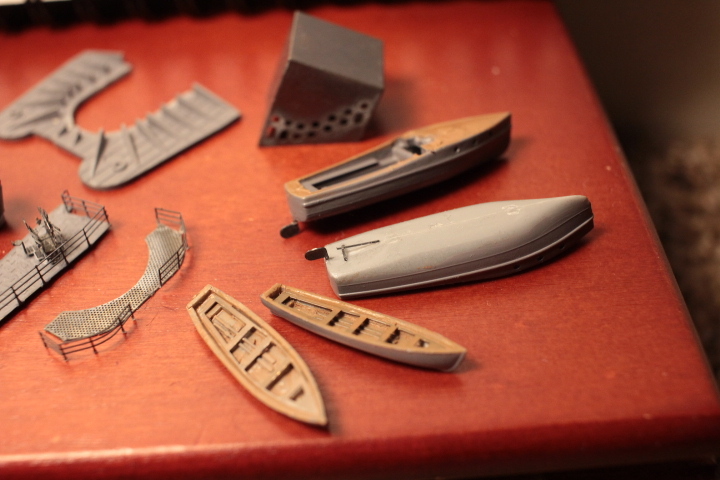 My brother and I figured out ourselves the Tamiya paints for the hull. We started with the anti fouling red, brushing along the waterline using different tones of brownish red and red. The black waterline is also painted. 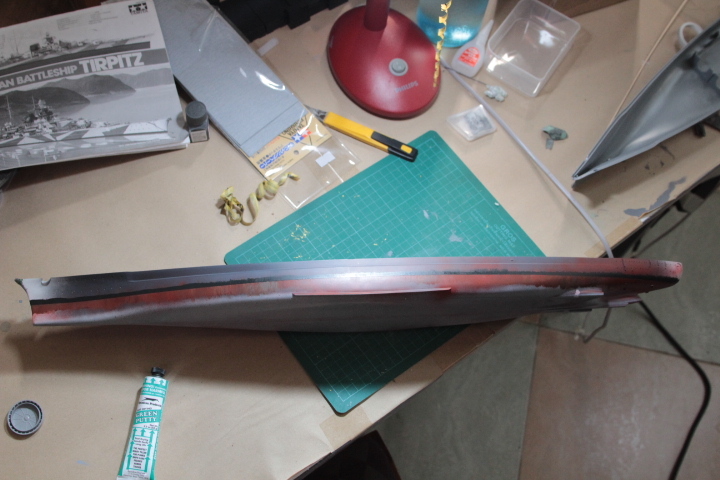 Then masked the hull and sprayed the upper hull with Tamiya Light Grey Surface Primer. 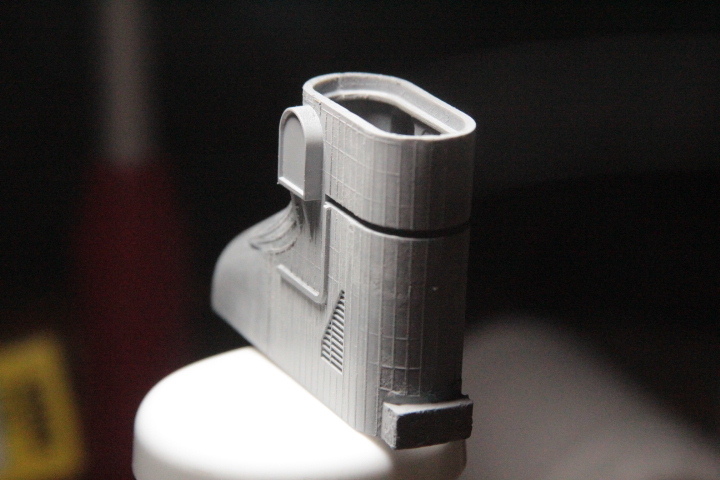 Here's dry fitting. 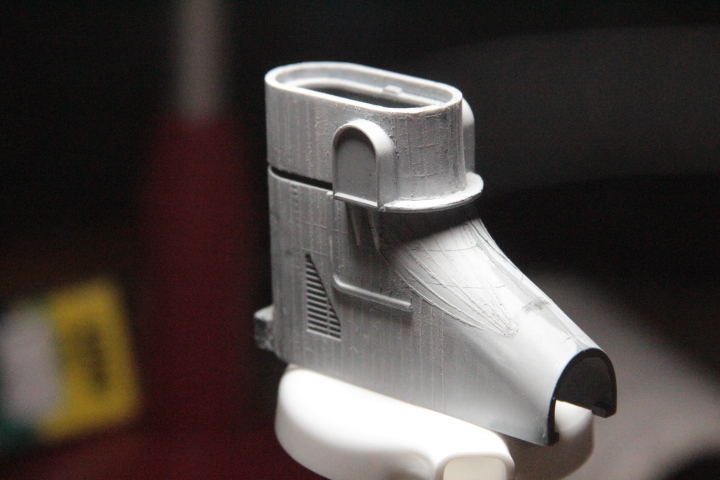 We sprayed down TS-48 (Gunship Grey) as a base colour. Then finished with XF-24 using airbrush. The Tamiya weathering set B is also used. Last edited by Aop Aur on Fri Jan 08, 2016 12:16 am, edited 2 times in total. I Hope that has paid off for over an hour of working!! Here comparing to another rangefinder that has no details added. Hope this build would come out nicely like others! this looks really nice, kinda love the Tirpitz. kit was nowhere near as nice as this Tamiya. Had a real PAIN getting the deck only attached, even bought feeler gauges, for car points, to help guide it in but still ended up ALMOST throwing it against a wall. I had gotten the kit at a LHS in Florida in 1996, done most of the upper sub-structures, guns, and boats, then they sat in a container for about 15 years, of course had to re-spray everything. Had done the deck up nicely, but the drag with that kit was the dividing area between 'planks' was ridged UP, which defeated the idea of doing a wash that would fill in between planks to slightly different shade/color. As it was, I had to do so much deck touch-up, using three different shades of "brown", (sand, wood, light tan, and one artist-oils Sienna), that it still worked out OK. I was pleased, deck-wise. 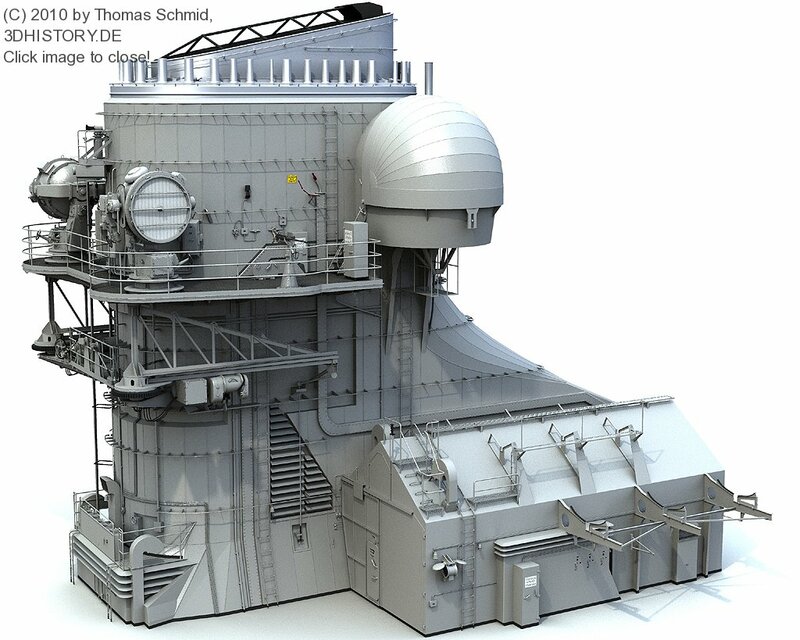 that a whole project itself, (right back-drop, cut foam, I have two completed Schellboote, also from Heller, to place alongside a to-water gangway, four gangways came with the PE). other things to do. 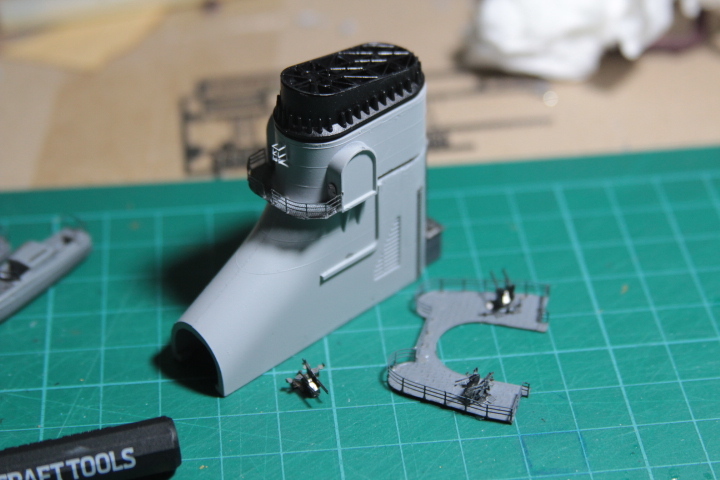 I hated it(sorta) when I got done, but then also want/ed to do a 1/200 Tirpitz. Go figure. 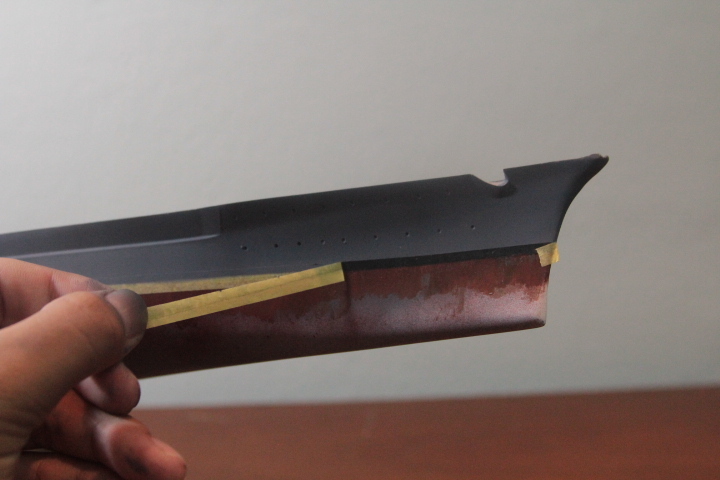 it is 25 inches long, and aside from a 25-inch long SR-71A above my stereo, is the largest model I have done. Certainly the most complex. 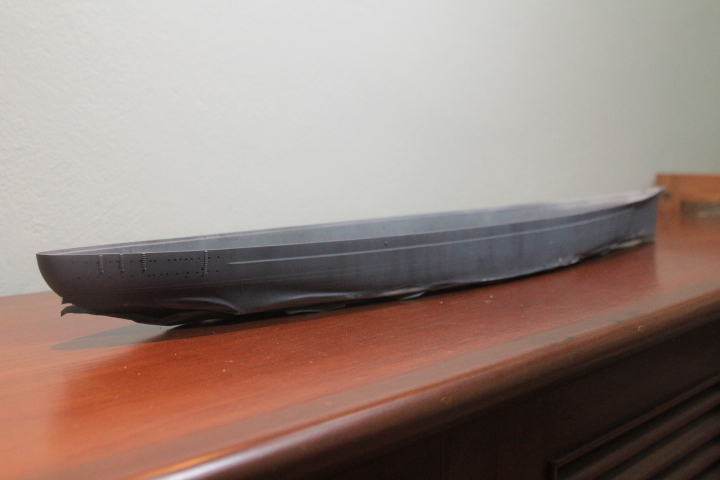 Had a 25-30 inch long Tirpitz profile, printed on joined regular printer paper, taped together, above the door, inside, of my hobby room, probably still there. 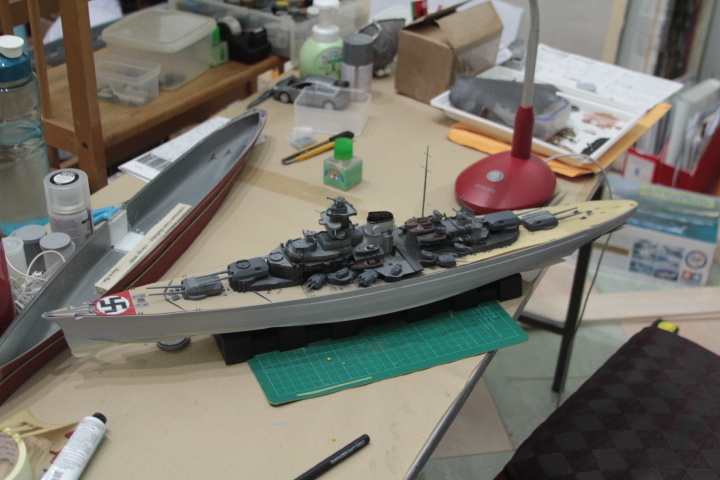 I think that the Tamiya's Tirpitz is a very nice kit, although it was released long ago. I don't know anything about Revell's version, but that might be another nice kit as well, together with Pontos set in the future. 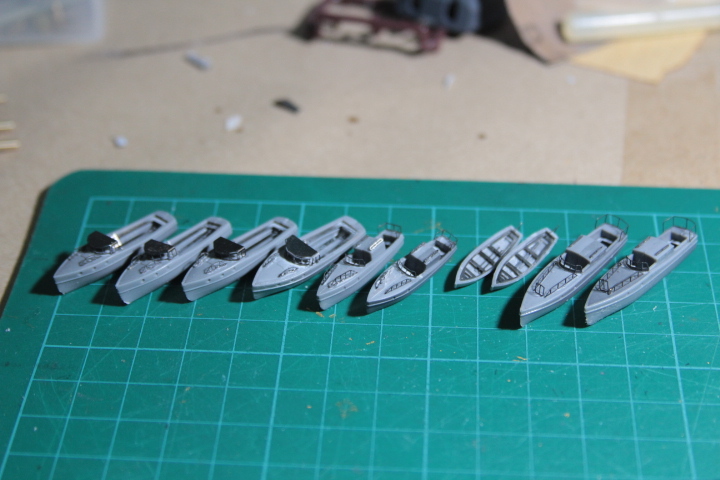 We started too many ships at the same time, and are having quite a hard time finishing one; only a 1/350 AFV club I-58 submarine (at completion version) managed to sail out of the stash. 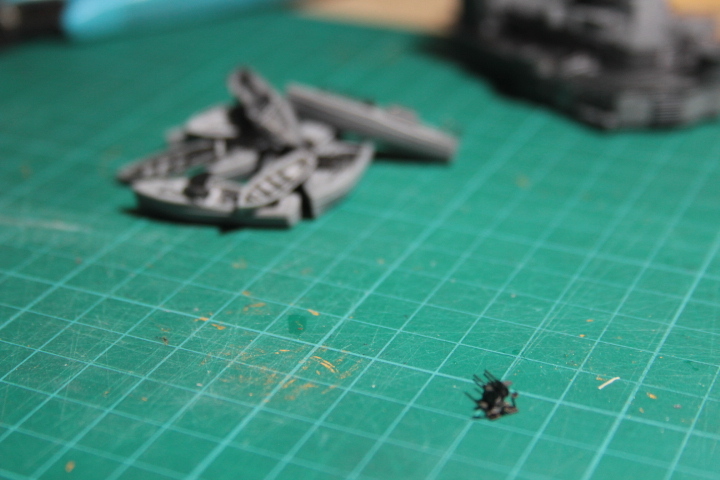 Regarding your Heller's Tirpitz, that seemed to be a valuable experience for a modeler. Not long ago we bought a 1/800 Bismarck by Academy, and decided to build her just for fun; it was a good decision. 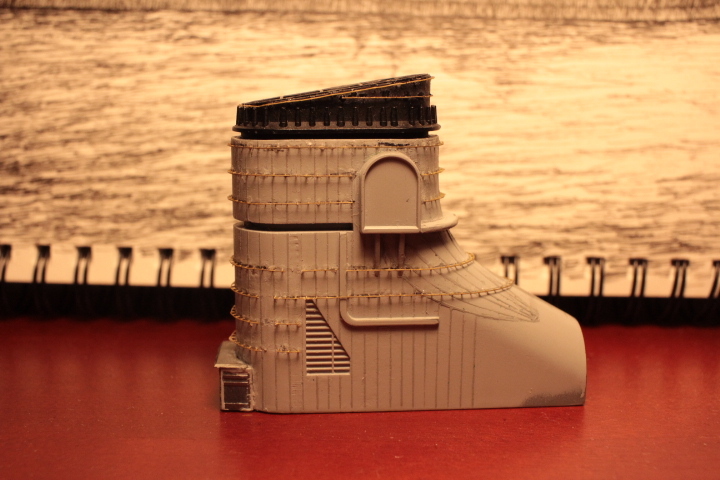 The kit was designed to be motorized, so not to mention the underwater hull accuracy at such scale....and the superstructure and turrets were nothing near Tamiya's, or even Heller's. I painted her a camouflage I made up myself. Not too bad, I hope. 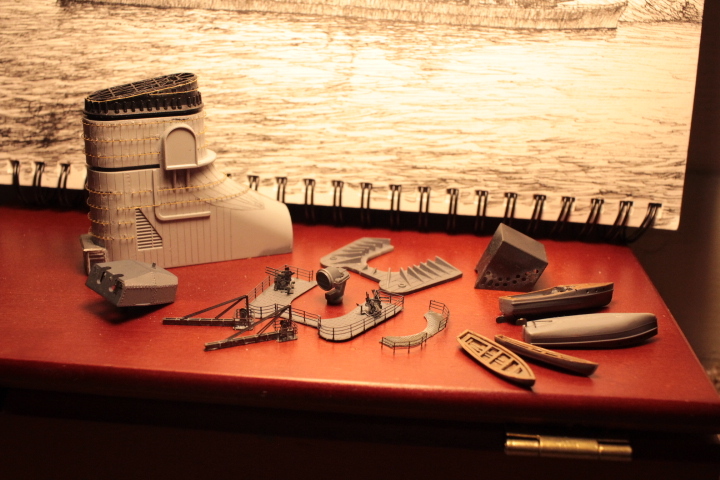 So to mention your 1/200 Tirpitz, is that the Trumpeter Bismarck to be converted? 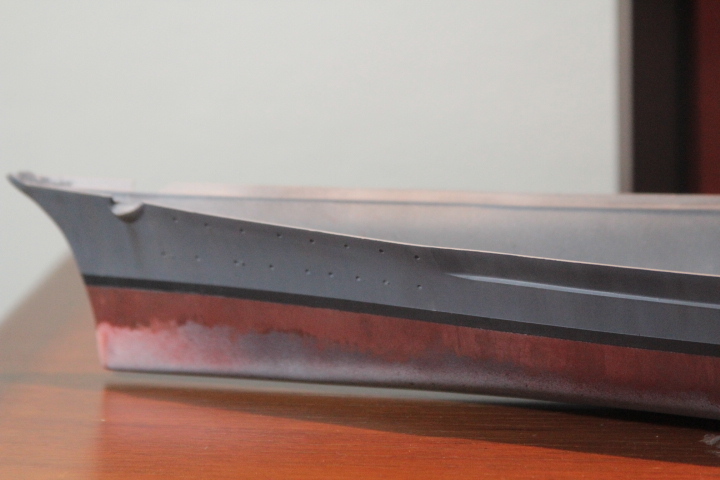 Using Pontos's Bismarck set would be nice, only that the price is rather high. I always dream of having large model kits in my stash. 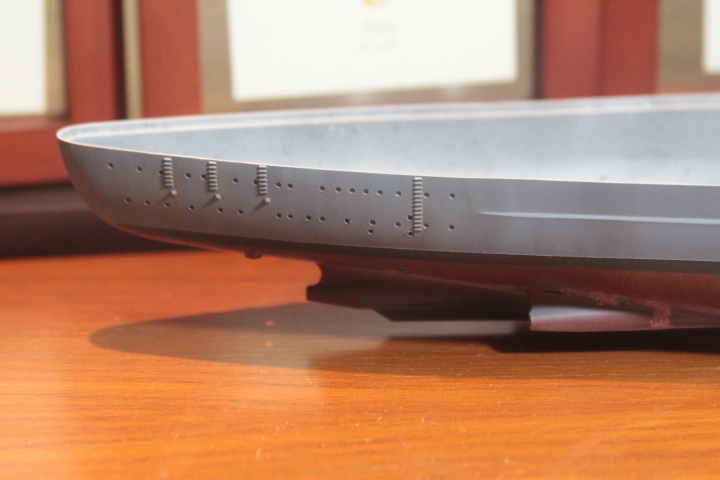 My biggest one right now is a 1/350 Tamiya USS Enterprise. She is waiting her turn to be built, but for how long I wouldn't know. BTW, you can post your Heller's Tirpitz here too, if you like. I will definitely want to see it. Sounded like she got lots of improvements. Have a nice time modeling! As far as I know those are actually small foot rails, not part of a degaussing apparatus. 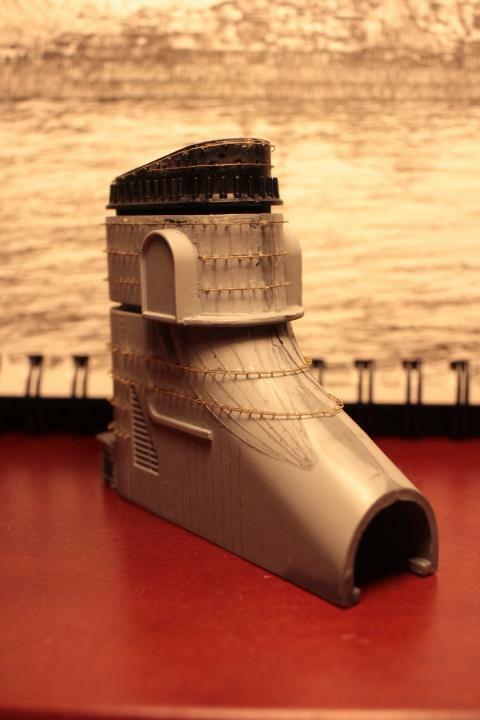 I was looking for DKM hand rails on Ebay, but, instead, I found a cheap 1/350 Ship Vessel Detail Update handrails for general use, so I won the bidding (maybe because it's a product that is not so necessary for most builds that already have considerably good upgrade sets, so no one was interested except me) At $4.99 it is quite cheap! As many knows, Tamiya's 1/350 Bismarck and Tirpitz kits were released long ago, and many details are incorrect. We tried our best on improving the kit's funnel. The main deficiency of this funnel is the trunked portion. the 1/350 Revell and 1/200 Trumpeter have square trunk at front, while Tamiya and Academy (a copy kit of the Tamiya) have it rounded; wrong. I am not very good at rebuilding things, plus correcting errors would be endless as for this kit. 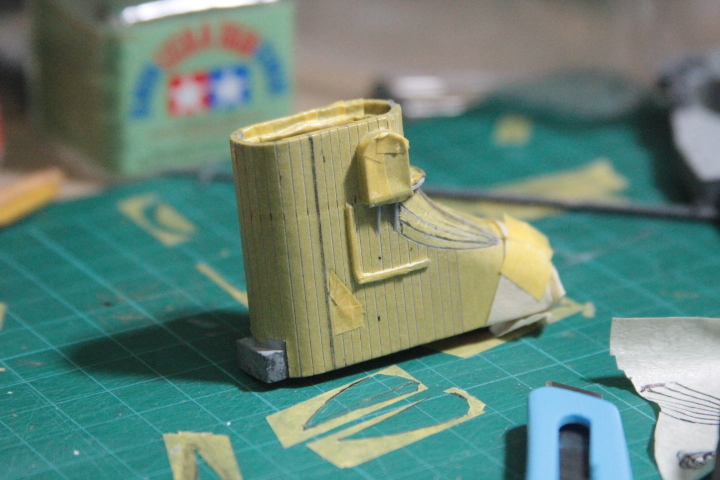 So, our method of replicating this is using Tamiya masking tape; cut the tape into 1.7 mm wide strips (this was measured according to the Bismarckclass.dk Tirpitz plan scaled by eyes and a ruler, due to insufficient info, so not very exact.) 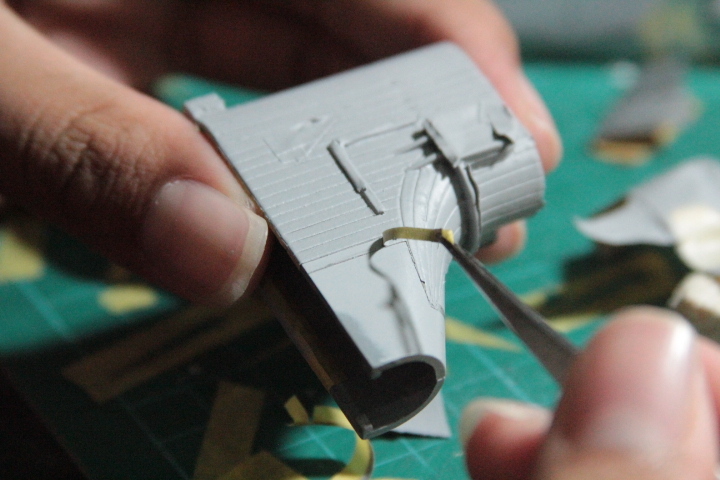 Then, place them individually on the funnel, spacing them a distance roughly 1/3 mm so that when sprayed with primer, the strips' width would the same of those you spaced the tape. More added. Note: the strips running down the trunk at front is not exactly correct, resulted from the funnel's incorrect shape and insufficient info. 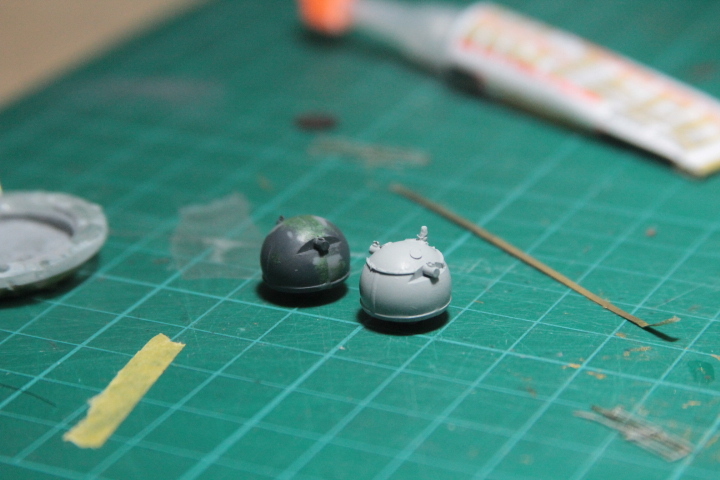 Then sprayed the Tamiya primer on. 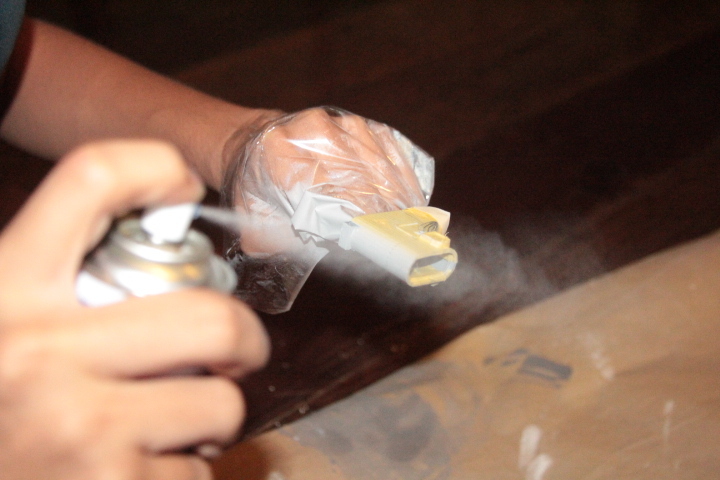 I tried not to spray too many layers. 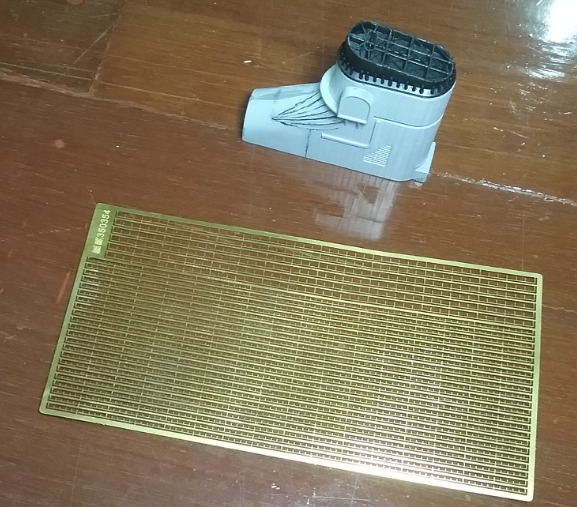 That would create too thick strips, which is oversized comparing to the 3D photo above. 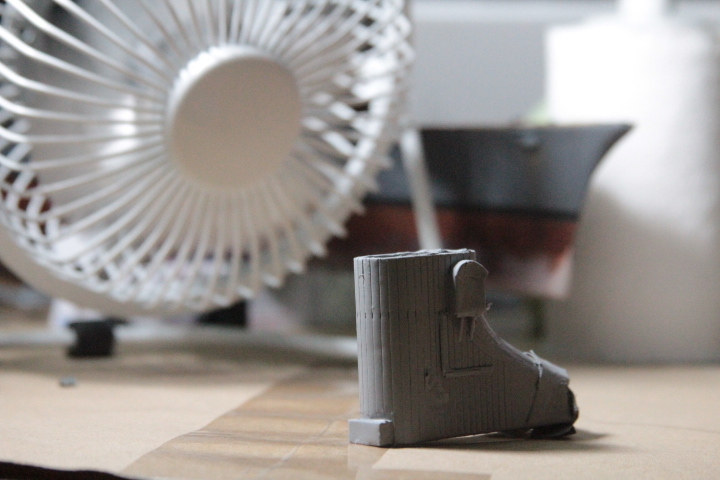 Just bought a new little USB fan, so it helped us dried the primer. Then after about ten minutes, we started removing the tape. Was very excited the method would work or not, but what a relieve to see a rather nice 3D strip popped up when the first piece of tape strip was removed! 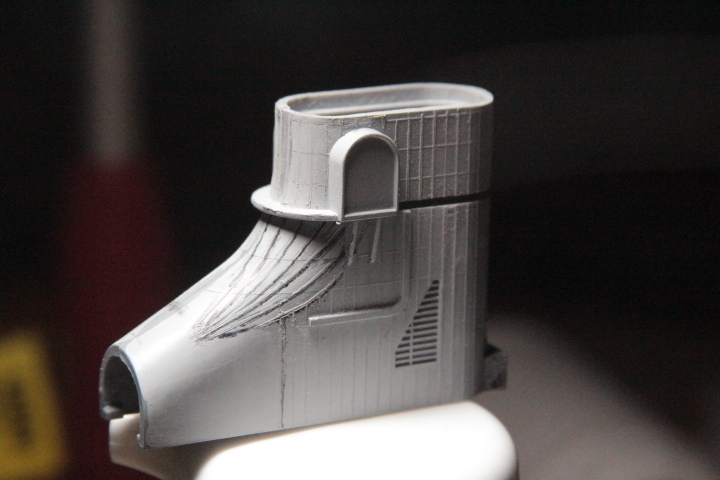 Here are final pics of the funnel with all masking tape removed. 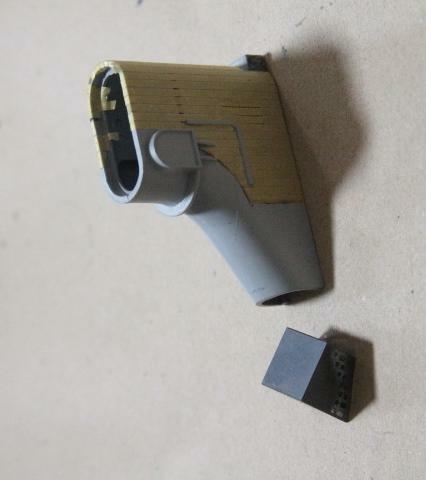 I also sanded it down a little, so now I know I sprayed a weeny bit too thick. Hope this looks okay to you all too. 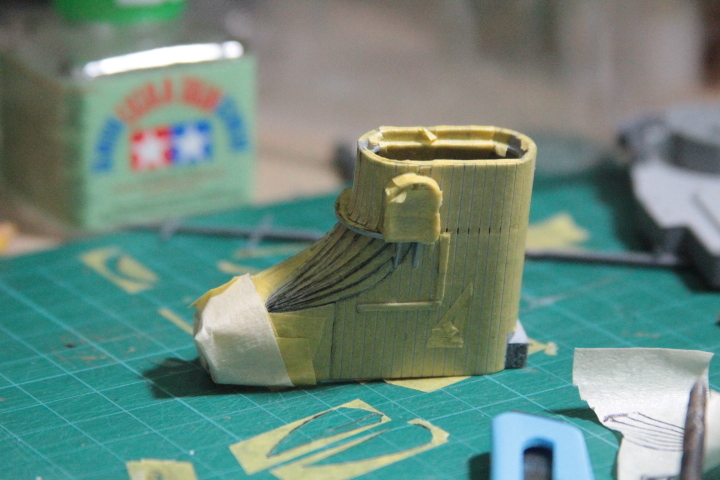 It is our first attempt in using this method to create this kind of thing, the first project with serious (hope so) detailing, as well as one of the first model to be completed! Last edited by Aop Aur on Sun Mar 20, 2016 2:59 am, edited 5 times in total. 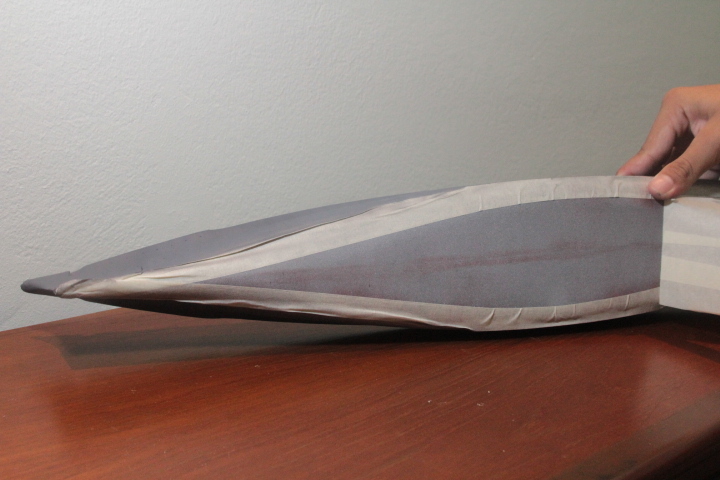 a smart idea for replicating the funnel structural ribs...really nice executed, too. a smart idea for replicating the funnel structural ribs...really nice executed, too. love it! Thanks for the compliments, we really appreciate them. Although it is not historically exact, we are quite pleased with the result, and glad you like it! Glad you follow our thread! 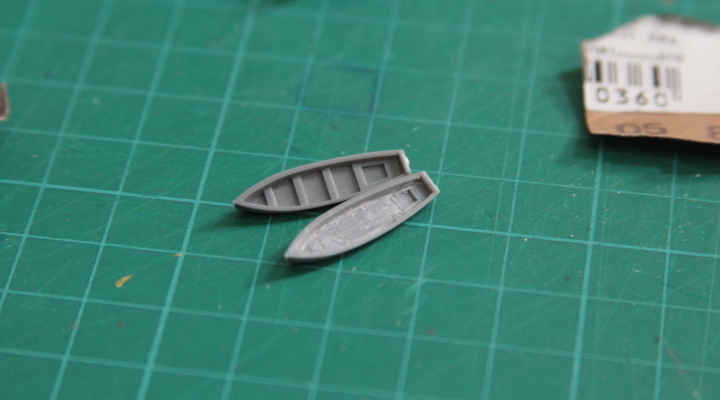 The Ship Vessel Detail Update handrails for general use just arrived today! Next, the Gator glue! Can't do PE works at all right now! It has been quite sometime we did no update at all, mostly because we were (and are still) very busy practicing the piano to attend the Jacobs School of Music in Bloomington, Indiana. Back in early December 2015, we were practicing hard for the prescreening round, and since we passed it, we have to continue practicing for our audition in early March 2016. We also took with us most of the parts we could take to Bloomington, hoping to work on the build here(!!?!?) Many security guards at the airports asked us "What is in that box (all tirpitz' parts/PE fret in it) and that big tube (Lion's incomplete frames)? ", or "Ship models? Cool, I like them!!". 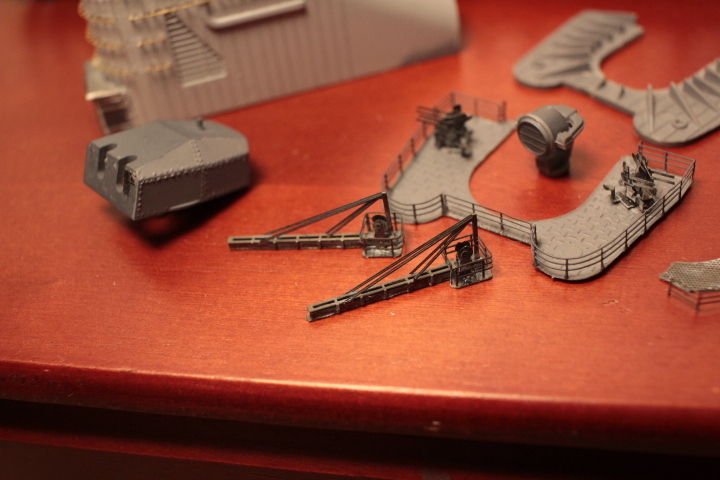 We made very little progress here, only a couple lines of handrails and other small PE parts, and due to the cold weather, the glue worked terribly. 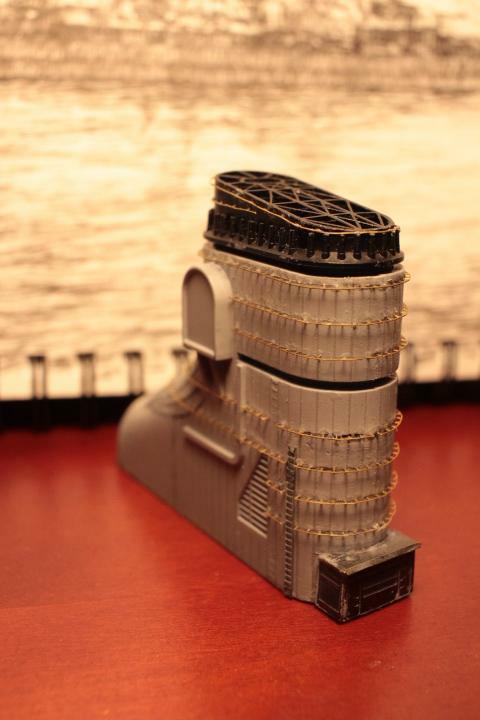 We kept in touch with Maarten, and he adviced us many things on the Lion and Tirpitz builds, and together we found out that Tirpitz did not actually have the vertical flat strips running down the funnel, according to Revell's kits, which clearly distinguished the two ship's details. And unless someone can dig up a very clear photograph of the ship's funnel, we can only assume it is another difference of the two ships. The more we look, the more we find. Still, we considered leaving them there, cause we put much effort into them. Thinking optimistically, there is nothing bad, and the funnel got some extra details, at least! So, here are the photos of the progress we made. They were taken some days ago when the weather was still cold. We met some lovely snow here, and also the first frozen streams in our lives! 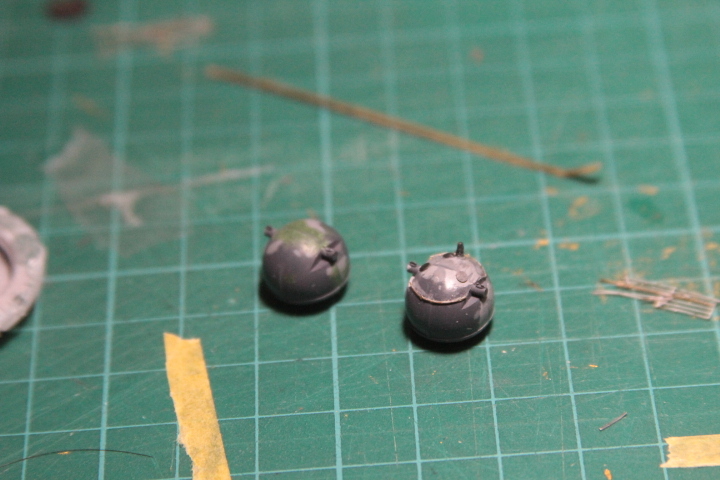 Here the secondary turret's bolts were made of little dots of Scotch glue, using a pin. 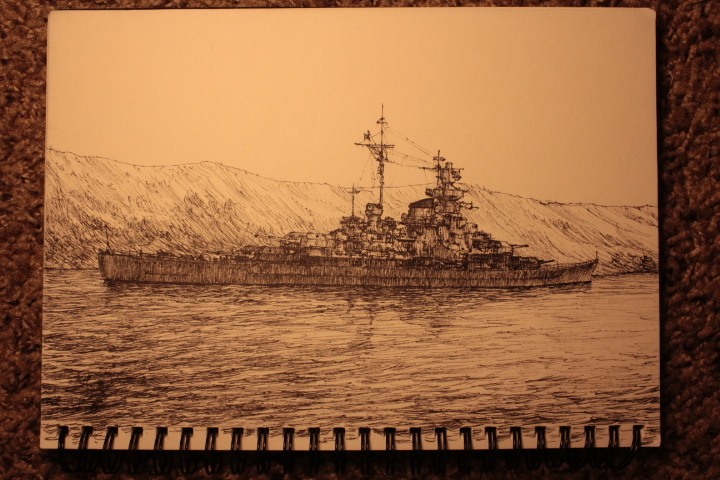 Here is Aur's drawing of the Tirpitz he made while waiting for piano lessons.